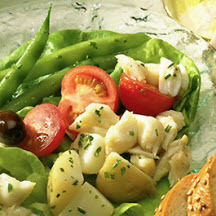 CooksRecipes has quality, kitchen-tested recipes for delicious seafood main dish salads made with a variety of fish and shellfish, such as shrimp, crab, lobster, tuna and more. 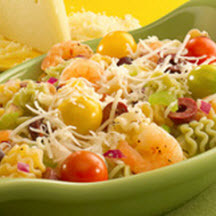 A zesty, Mediterranean-style shrimp salad tossed in a fresh lemon vinaigrette and garnished with Asiago cheese. Fiery-spiced, grilled prawns served atop a salad of mesclun tossed with a Parmesan dressing, garnished with cherry tomatoes and shaved Parmesan cheese. 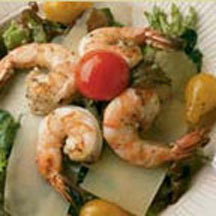 Classic Niçoise-style salad with one exception, succulent shrimp replaces the traditional use of tuna.